How long does it usually take for African Ringnecks to be bonded? I introduces my female to the male three weeks ago. I put a nesting box in the cage, but they wouldnt go inside it. So I put millet spray inside the box with a bit of the millet spray sticking out and they finally went inside of the cage. Sometimes the go in usually the male by himself goes in there the female I have only seen her inside once or twice. I also started givig them more calcium and have changed there diet so that they get more and healthier food. Should I give them boiled eggs? I heard its bad for them. I know the breed during the winter and spring. Do you guys think I can get a cluth this spring? What other things can I do to encourage breeding? They are still on their first date. If you know so little about them why are you wanting them to breed? I have single male and female Cockatiels in my flock. They are friends but don't want to get married. Welcome to the forum! I doubt anybody here can help you because there are no breeders - we are just bird keepers and lovers. I breed canaries (which are nothing like parrots because they are promiscuous and don't mate for life) but, going by them, you need to wait until they reach the age of sexual activity which is later than when they go through puberty (you don't say how old your birds are but they would need to be, at least, 3 or 4 years old). And you also need to start conditioning before breeding season (you seem to have waited until now which is too late). I do know that psittaculas are short day breeders and, if they breed when other short day breeders do (like cockatoos, grays, etc), it's a bit too late for them to start now (my CAG is on her second clutch right now). Aside from all that, parrots don't mate-bond in three weeks, it takes them a loooong time (usually, from one year to the next). And yes, eggs are bad for birds. With all due respect (I don't mean to offend you), you don't seem to have enough knowledge to breed them. Ringneck parrots also don't mate for life so i daught it'll take a whole year for them to "bond." I have bred budgies, but never African Ringnecks so I was just lookin to see if anyone hear had any tips. My birds are sexually mature they are three years old. My male has a dark ring around his neck and has blue on the back of his neck which shows he is mature. The female doesn't have a ring as females don't get one, but the breeder i baught her from said she was 3 years old (I trust this breeder a lot.) I waited untill now because I read that it was better to put in the a nest box in the cage now because if I put it in during winter there might be problem such as egg binding. So I just waited till now was that a bad idea? As for the food when I baught the female the breeder said she was ready to breed as the breeder had been preparing her to breed. I know it may be to early as only three weeks have passed, and I know ARN's only breed during this time, so will I have to wait till next year than? And yes I don't know a lot about breeding this parrots as this is my first time, all my knowledge i have acquired from reading articles from multpile sources, and breeding budgies. I just wanted to see if anyone had any tips, hey theres gotta be a first time. I do not wish make money out of this birds. If you have the room and you actually planned on keeping the offspring why dont you reconsider and fill that space with a rescue or two instead. Yes I am aware of the feral parrots specially the ringnecks in England. And yes I have space for the babies and the money to take good care of them. I would adopt but I really want to hand rais a baby parrot or prrots. And adoption seems to be yoo much hassle. I tried adopting once but the process was too long. When i said homeless parrots i meant the ones given up to rescues not the escaped pets that survive in the wild. Its great that you can take care of the babies when they are adults, its best to only breed if you are going to keep the young. Are you prepared with syringes, formula and an incubator for when the mother rejects one? Also the waking up every 2 hours throughout the night to feed it. 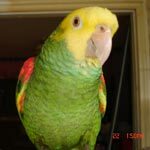 I know someone who was a very loving pet owner but they had no choice but to give up the baby parrot they raised because it was viciously attacking them when let out of its cage. The second owner never had any issues because in the parrots mind it had left the parent and found a mate. liz wrote: They are still on their first date. I was meaning even though you have a male and female it does not mean that they will mate. They are just like humans and have to want to be mated. They may become friends like my cockatiels are doing and not mate. Ygmu99 wrote: Ringneck parrots also don't mate for life so i daught it'll take a whole year for them to "bond." I have bred budgies, but never African Ringnecks so I was just lookin to see if anyone hear had any tips. My birds are sexually mature they are three years old. My male has a dark ring around his neck and has blue on the back of his neck which shows he is mature. The female doesn't have a ring as females don't get one, but the breeder i baught her from said she was 3 years old (I trust this breeder a lot.) I waited untill now because I read that it was better to put in the a nest box in the cage now because if I put it in during winter there might be problem such as egg binding. So I just waited till now was that a bad idea? As for the food when I baught the female the breeder said she was ready to breed as the breeder had been preparing her to breed. I know it may be to early as only three weeks have passed, and I know ARN's only breed during this time, so will I have to wait till next year than? And yes I don't know a lot about breeding this parrots as this is my first time, all my knowledge i have acquired from reading articles from multpile sources, and breeding budgies. I just wanted to see if anyone had any tips, hey theres gotta be a first time. To tell you the truth, I am not sure if I believe that IRNs don't mate for life. I have seen many times the 'they have different mates throughout their lives' but I've never found a single report from a reputable source that, having observed a banded flock for a number of years, stated this unequivocally. The thing is that one cannot use the behavior of parrots in captivity to determine these things because, in captivity, they have no large pool of individuals to choose from so I have often seen pairs that having been alone all their lives, have bonded with each other but, once they join a flock, they split up and get new mates -and this with birds that are supposed to mate for life! So, is this something that was observed by breeders who, not realizing that captivity does not provide natural behaviors, reached a wrong conclusion? Or is it true and it does, indeed, happen the same way in the wild? I don't know. What I do know is that breeders put their pairs together way before they are supposed to breed and don't allow them to even see other birds - which is not natural at all because they are highly social birds. At three years of age, they should be mature enough but I have read that, in the wild, they start breeding when they are 3 to 4 years old so it might be a bit too early for them. Also, they are short-day breeders so they start producing sexual hormones in January and breeding in Februray and March although there have been cases when they do it in April so I think it's too late for them this year (my short day breeders are on their second clutch already). You can't really call breeding budgies having experience and I am not trying to put you down with this but budgies will breed under the worst conditions and keep on doing it (even when the babies come out all deformed) until the mother dies from depletion or eggbinding. They are easier to breed than canaries - and that's saying a mouthful! Can you commit to multiple parrots for 50 years? Housing them, splitting them up if they dont get on? Seperating them if ill etc etc so much to consider. By the way, what happened to your budgies?